Today’s geospatial users face difficult challenges to meet the tasks placed upon them. A proliferation of sensors coupled with a continuously connected environment has led to shorter analysis time cycles and a demand for rapid delivery of products. Day-long operations that focused on siloed, single-source analysis are in the past—today’s operations require a holistic approach, leveraging all available information to deliver products in hours, not days. Information-technology advances enabled the expectation of shortened cycle times. Fast networks are pervasive, computing power is extensive, and data storage is almost unlimited. On top of such infrastructure, software systems coupled with open standards are delivering a continuously connected environment that provides immediate information discovery and exchange, distributed resource use, and diverse system access. To operate in this taxing environment and meet shortened deadlines, geospatial users need a common reference point—an understanding of the context they’re working within. The key reference point for modern geospatial users is the location they’re working within. Whether it’s a virtual representation or an in-field deployment, the geospatial context provides the critical foundation. 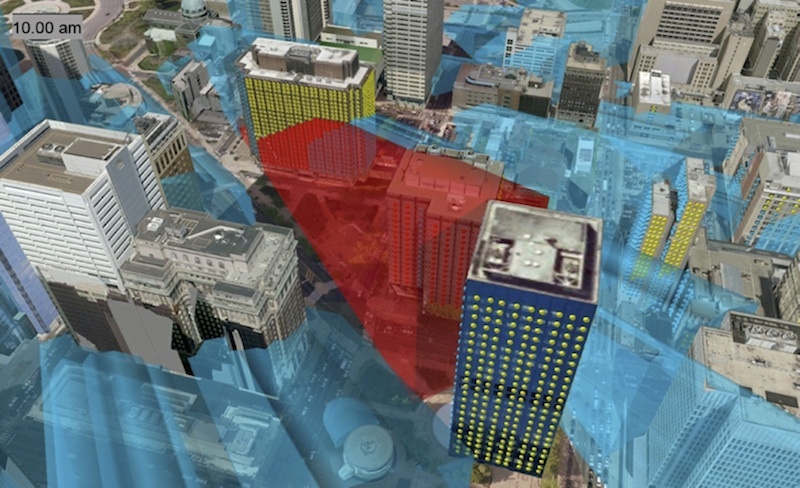 Esri’s ArcGIS can be used to analyze building shadows in a 3-D environment. Such “geocontext” exposes interrelationships and overall structure that play a critical role in geospatial operations. And for today’s demanding and time-critical geospatial environment, highly accurate and information-rich visualization technology is providing a rapid and natural methodology to communicate geocontext. Using the latest technology to visualize and communicate a region’s geocontext isn’t a new concept. For years, maps, globes and photographs have provided a means to communicate and understand a location’s context. Fitting to the limitations of this media, context was communicated through specialized symbology, graphics and terminology. As with most industries, the advent and rapid advancements of information technologies during the last 50 years had a dramatic impact on geospatial sciences. 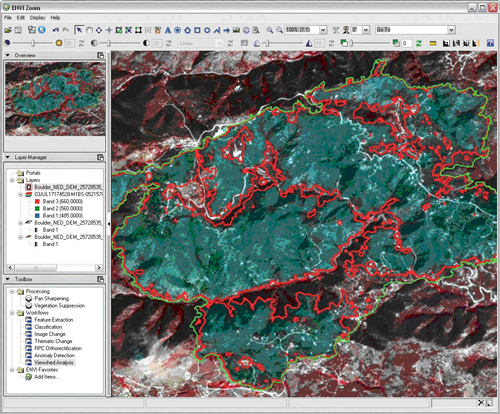 Paper maps, measurement tables and photographs have all given way to digital technology, enabling rapid computation, display and communication of geospatial information. Of all these advances, computer visualization has had the greatest impact. Initial digital systems leveraged existing metaphors and operational workflows. Existing mapping structure and symbology defined the lexicon and paradigms used to communicate geocontext digitally within GIS applications. Visualization and analysis of digital imagery employed a layout and tools that mimicked the structure of photographic-analysis light tables. Using existing mapping structure and symbology, it’s possible to communicate real-time information within a GIS application, such as wildfire hotspots and fire-endangered structures. Although the systems provided vast improvements in creating, sharing and exploiting information, the overall communication of geocontext remained fairly unchanged until recently. New methods, led by advances in computer visualization, now are employed to communicate context. Spurred on by the highly competitive computer-gaming industry, the abilities of computer graphics systems have advanced at an incredible rate. Today’s graphics hardware and associated software technologies provide a highly capable visualization system, even on commodity platforms. The availability of these systems is enabling a new method to communicate geocontext through lifelike virtual scene rendering. Communicating geocontext no longer requires specialized symbology or is forced to fit within the 2-D constraints of earlier systems. Systems now can generate dynamic 3-D scenes that visually express geocontext through lifelike renderings. Although lifelike scene generation has existed for years, it often required specialized hardware or generated static scenes due to limited resources. This no longer is the case with modern deployments, which are fully interactive and dynamic. Scenes are generated “on the fly,” enabling the ad hoc interaction and manipulation required to fully communicate geocontext to users. And these lifelike geocontext-generation systems are in wide use today. Maps and photographs as well as standardized symbology, graphics and terminology enable rapid visual communication about real-time events such as the 2010 Four Mile Fire in Boulder, Colo. Although often a fantasy environment, some of the first systems to deliver this capability were video games. Whether a world filled with flesh-eating zombies or happy, fluffy bunnies, video games use 3-D visualization technologies to provide geocontext to players. It’s now common to render virtual scenes that represent the real world to communicate geocontext. At the forefront of this trend is Google Earth, which provides a common platform to view, interact and display geospatial information within a 3-D scene. Lifelike geocontext visualization capabilities are moving from gaming and general consumer markets to specialized tools aimed at geospatial users. Going beyond virtual context generation, these professional-grade tools provide the required data format support, accuracy requirements and product-generation capabilities to meet geospatial users’ needs. A good example of this transition and use is shown within Esri’s ArcGIS product suite. Originally centered on map generation and geo-analytics, ArcGIS now provides a fully interactive, highly accurate 3-D environment that supports a strong set of geo-processing capabilities. The ENVI product platform from ITT Visual Information Solutions is another example of this capability. 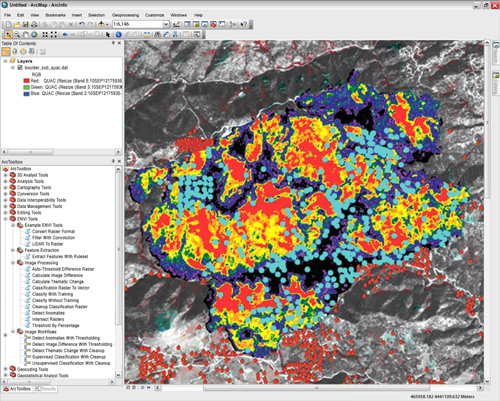 The recent addition of light detection and ranging (LIDAR) functionality to ENVI enables rapid geocontext generation from LIDAR and imagery sources. With this capability, the relevancy of a geocontext only depends on gaining access to the latest data. A geocontext-generation operation that nominally would take weeks to complete is now reduced to hours—a dramatic decrease in accessibility cycle time. These professional-grade applications generate realistic scenes that provide a foundational geocontext for information display, analytics and exploitation. They accept users’ input, including information from GIS and remote- sensing sources, and enable rapid comprehension and understanding of the relationships between locational context and observed data. In these applications, lifelike visualizations of geocontext enable geospatial users to rapidly meet operational goals. Although lifelike, virtual-world visualization is leading a revolution in how people understand and operate with geospatial information, the next generation of visualization technology is moving the use of geocontext from the workstation and into the field. Referred to as augmented reality, these applications leverage the connectivity, orientation and location capabilities of mobile systems to enhance the real world through real-time overlay of geospatial information. Long used in high-end and specialty systems such as aircraft heads-up displays, augmented reality is one of the rapidly expanding metaphors for visually enhancing local geocontext. Leveraging the capabilities of modern mobile platforms, applications can determine a device’s location and orientation. Using this information, they overlay geospatial information over the live feeds from a device’s video camera to display an augmented-reality visualization to users. Applications for such technology span many fields and use cases. Examples include emergency response, military operations and navigation. 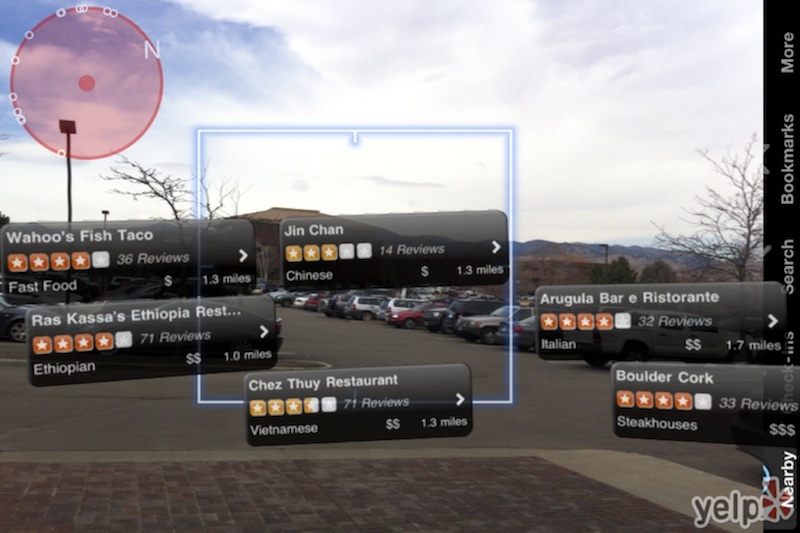 A novel example of using augmented reality for navigation is the Yelp iPhone application, which maps the location, distance and reviewer ratings for nearby locations on top of a feed from a phone’s camera. The applicability of augmented reality to enhance geocontext is just the beginning. As mobile technology and communication capabilities expand, these systems will be part of everyday interactions and use, enhancing geocontext with the latest information in real time. As geospatial information sources and availability expands, the tasks placed on geospatial users are increasing. The need for expanded information products delivered in a shorter timeframe is hitting the limits of current operational processes. Using local geocontext is one method to mitigate such limitations. Understanding local geocontext through modern visualization technologies is another method to solve the geospatial operational overload. Through the use of visualization techniques such as lifelike virtual scene generation and augmented-reality overlays, geospatial users can rapidly grasp local context and leverage that knowledge to meet the growing complexity of their operational environment.